Previous Post We’re off to the beach! I would choose b so I could win prizes and make my elders proud. 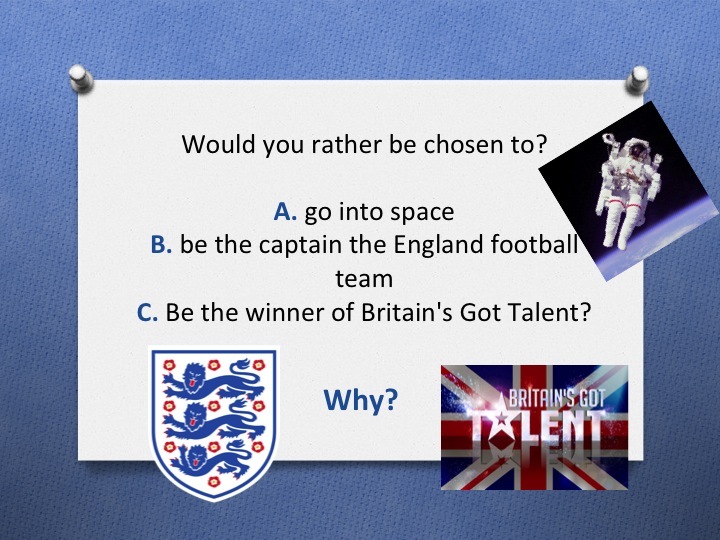 I think,that I would choose B because I would be living my dream of being a footballer.And I would have the money to go to space and I can try to win Britan’s Got Talent. if aliens are real or not, because I don’t know if they exist. I want to go in an alien ship to go to the moon! I would rather be chosen to go into space because I want to be an astronomer when I grow up. The reason being is that I find planets fascinating, since there are so many things to research and study about. It would mean so much to be someone who actually made a living in space! I would go into space because, I would get to know if the stars are really as small as they seem and if anything lives on the moon. I would be the captain of the England football team because with that money I would be rich and I would buy my own jet and go to Africa and give everyone there the money that they need to live and to take there children to school. of a football team the reason why I would choose of those is because they all sound fun and a exsiting thing to do. I will choose C because I will earn money to go to space and after when I grow up I will be the England’s football team Captain and I will be very famous because I will be on TV. First I will be the winner of Britan’s got talent and then I will spend those money to space. I would like to be the winner of britens got talent because i will win load of money that i could share with my family and give some money away to people in home’s .